Looking to entertain guests with style and elegance? 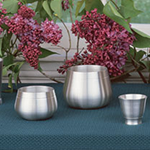 We offer high quality pewter serving & entertaining gifts, as well as engraved dining accessories. 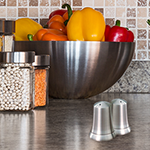 Give a pristine pewter housewarming gift with a personalized message to your loved ones! 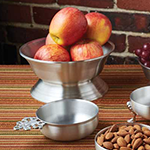 Every one of our pewter dining accessories and pewter serving gifts are handcrafted at our New Hampshire location. Take a look at our fine selection of personalized pewter serving & entertaining gifts, and choose a custom engraving that speaks from the heart. 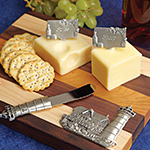 Durability of wood and eglegance of pewter make these the perfect way to entertain. Entertain in style with these plates & bowls. Our handcrafted tankards, mugs, & cups quality, timeless drinking vessels. 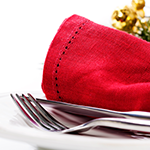 Napkin rings are a beautiful way to show off your prettiest linens. More pewter accessories for your table. Call us at 603-569-4944 with your questions. WeÆre here to provide you with some of the finest quality pewter craftsmanship in the world, at a price you can afford. Because every special occasion deserves a little pewter.